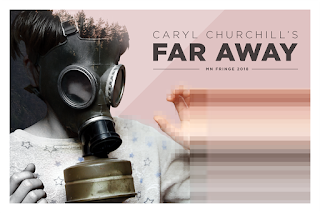 Cherry and Spoon: Minnesota Fringe Festival 2018: "Far Away by Caryl Churchill"
Minnesota Fringe Festival 2018: "Far Away by Caryl Churchill"
Summary: A terrifying post-apocolyptic world in which countries, animals, vocations, and even nature take sides in a brutal war. Highlights: Wow, this one is super creepy cool. And admittedly, I didn't fully understand what happened until I talked to a friend who had read it and looked at the credits. Which just makes me want to see it again, because there's so much there. It starts off innocently enough, with a young girl staying at her aunt's house who's harmlessly folding laundry. When the girl tells her aunt of a scene of blood and people held captive just outside the house, her aunt assures here that her uncle is helping people, and only killing "traitors." Cut to a factory of people making hats, for some unknown nefarious purpose (yes, nefarious hats), and the young girl is now grown up and a new hat maker, learning the ways of the company. In the final scene all hell has broken loose, literally, with a full-on bloody war between ever changing sides. There's loads of symbolism that would take more space and thought than I have time to give it to unpack. The story is fluidly and stylistically told by the ensemble, even the props (whitewashed boxes of different sizes frequently moved around to create different environments and bright, beautiful, weird hats) and costumes (shades of white and gray) help to to the story. But perhaps my favorite part of the play is the four-piece band that plays during scene changes, original songs (I assume?) so haunting and cool that I hope they're a real band so I can buy all of their albums (music direction by Tim McVean). This is an odd, disturbing, and perplexing little play (it's Caryl Churchill, so of course it is), thoughtfully, hauntingly, beautifully brought to life by Wayward Theatre.